Congratulations on passing the examination! Don’t make any careless mistakes on your exams. Few students could get more than 90 marks in the English examination. Grace passed the entrance examination. We have to study for our math and French finals. Let’s start with math. I am anxious about the result of the examination. I feel hopeless about my prospects of passing the examination. I felt like crying when I knew the bad result of the exams. 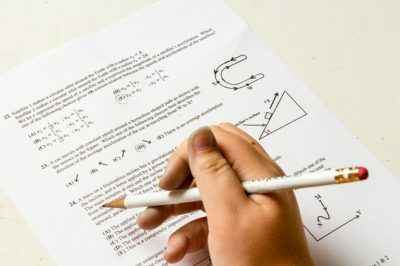 If you study English hard, it’s possible to get perfect scores on your tests. I hope you succeed in passing the entrance examination. I’m sure that she’ll pass the entrance exam. In many cases, students worry more about their examinations than is necessary. It’s normal to get nervous before exams. I was able to solve only half the number of the problems before the bell rang. I wish there were no such things as exams. Kim failed the entrance examination. Last month, I took the TOEFL, just to try it out. I did better than I thought. My last TOEIC score was so bad it’s depressing. My test scores were higher than the national average. Now make sure your names are on your papers and hand them in as you leave. Pete is preparing for his high school entrance examination. Studying is worthwhile. It helped me raise my TOEIC score by 150 points. The exam results are posted on the board. The result of the examination will be announced before long. The students were severely punished for cheating. The teacher was having trouble coming up with interesting questions for the exam. The whole class passed the test except for Tom. Unless you work harder, you will fail your examination. We usually have midterm examinations at the end of May. I’m trying to study for entrance exams, but my sister keeps bothering me. When I take examinations, I always get nervous.